I seem to be doing quite a lot of keyboard cleanups recently, the Pet, C128 and BBC that I've written up, and the usual collection of Commodore 64's and Spectrums I seem to do quite regularly. This is one such Spectrum, and it strikes me just how many parts there are in the thing. So you start with you standard Spectrum Plus, complete with 30 years of dust and dirt, and in this case, missing a key. 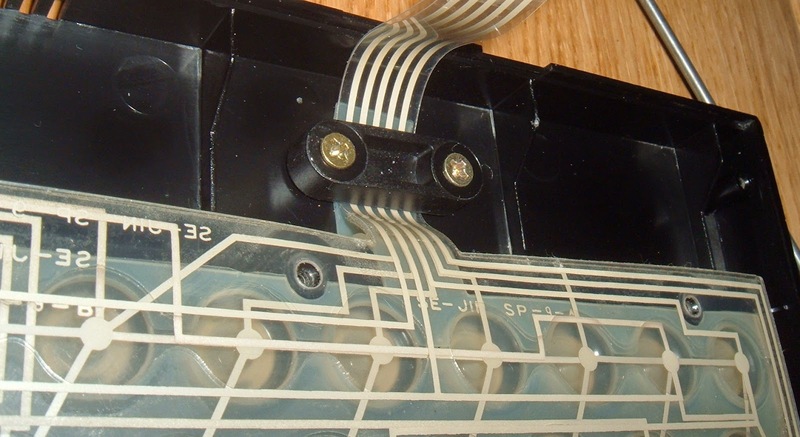 When opening these up, the membranes tails tend to be very fragile, and if they haven't already failed, opening the up without due care and attention tends to snap them. This seems to have happened to most of the 'untested' ones on ebay, usually just before or just after they went up the loft. This is one of the better ones, these clear membranes seem to be a lot more resilient than the brittle opaque ones. With the tails carefully removed, you get to the main board. 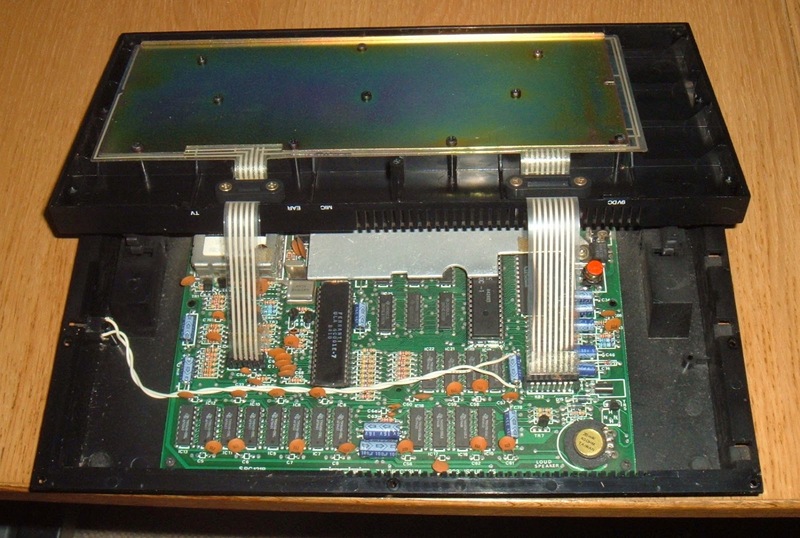 This is the same board as used in the original rubber keyed ZX Spectrum, with the addition of the reset switch (wired across a capacitor in the reset circuit). The big lump of metal at the top is the heatsink. 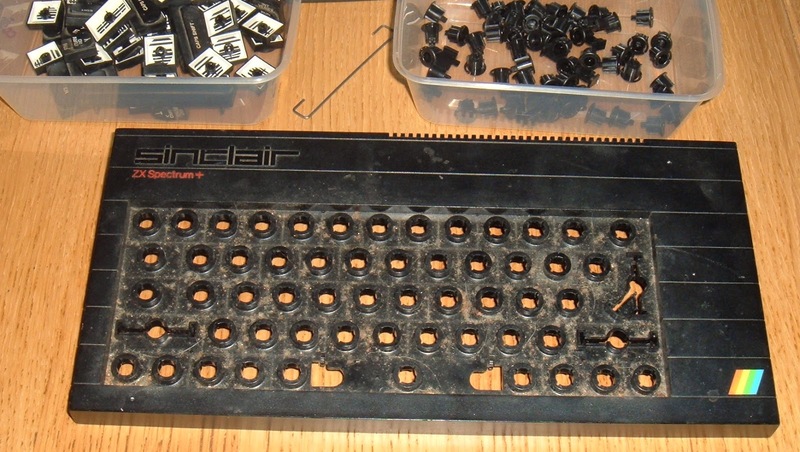 The keyboard is stripped down and the keys washed and cleaned. The case is also given a clean up. With the keys drying, they do seem reminiscent of a certain game. 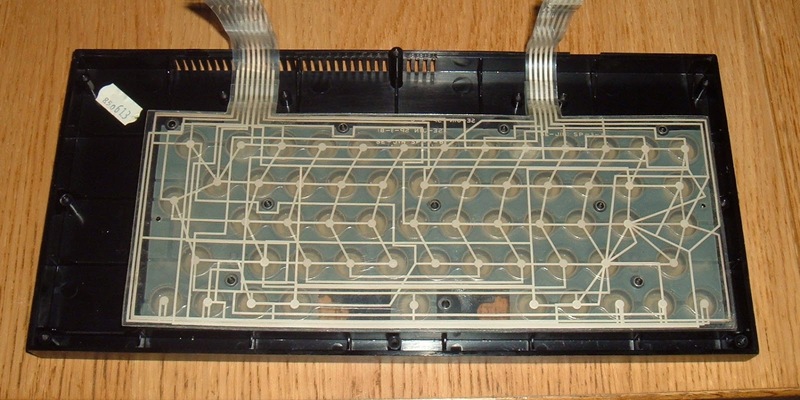 The process of putting this back together shows the number of layers involved in the Spectrum Plus's keyboard. 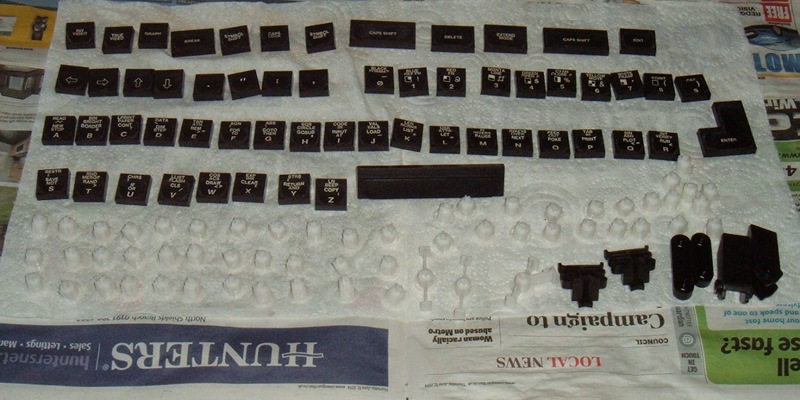 So first you have the case, then the keys, then the plungers, slowly being repopulated (and the broken one replaced). Once they keys are all in place, there is a rubber mat. After that comes the membrane. This is a multilayer membrane, and the layers need to be squeezed together by clamps. Sometimes a keyboard which doesn't seem to be working can be fixed by tightening these up. Although usually it means a visit to SellMyRetro to buy another RWAP replacement membrane. After the membrane, comes a sheet of cardboard, or sometimes plastic. And after that a sheet of metal and then it can finally be screwed in place. With everything all put back together, the final product is a much nicer looking Spectrum Plus. If the Spectrum is going to be used a lot, I recommend replacing the voltage regulator with a modern switch mode device. I usually have a number of refurbished computers available, contact me if you are looking for one.